Deciding how to arrange your seats isn’t as difficult as you may anticipate; the shape and size of your classroom usually dictate how your classroom must be arranged. Before you get to the business of moving your desks around, have a clear vision of what the room will look like. Be sure to factor in a number of variables that may never have crossed your mind. Are you going to do a lot of group work or cooperative learning? If so, arrange your seats in clumps or clusters. How mobile are you? If you hate being fenced in while you’re teaching, you need a big roaming area built into your design. Are you into group discussions? If so, you don’t want debating students to be able to look only at the backs of each other’s scalps. If eye contact is needed, eye contact you should allow. Where is the chalkboard in the room? Even better, how often are you going to use it? As a math teacher, you’ll use your chalkboard every minute of the day, so your students need a clear view of it. If you have multiple points of focus in the room, students will need to see all of them without dislocating their spines. Are there windows in your room? If you arrange your seats facing the windows and the sun is blinding during class, that may prove just a wee bit distracting. How do you pass back papers? If you insist upon returning papers one at a time, you have to leave aisles wide enough to accommodate students, desks, and book bags. How many kids have special needs? Find out ahead of time if any kids need to be in the front row because of visual or auditory problems. You may also want to seat potential troublemakers closest to you as a preemptive strike toward establishing class control. After you’ve answered these questions, you’re ready to pick the seating design that best suits your needs. Don’t be afraid to change the students’ seats or the overall design during the year, but don’t do it too often. While elementary-school students love the occasional seating-chart change and the new perspective it brings to them, secondary students are more territorial and prefer not to have things shaken up after they’re used to the routine. Before you start, make sure that you have enough seats to accommodate the largest class you teach during the day. If you don’t, inform the principal and/or the janitor to get additional desks. If you decide to opt for a design other than the traditional, rectangular, row-and-column arrangement, consider one of the following four arrangements, depending on the factors in the previous section. You can be just as successful a teacher using simple rows and columns. Many fine teachers never deviate from the old standard for their entire teaching career, and it suits them just fine. 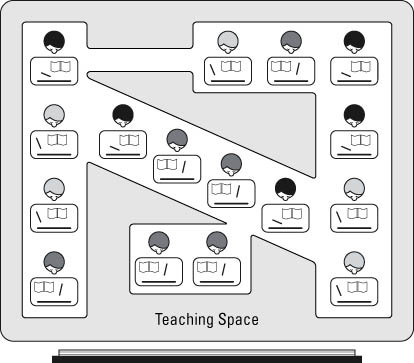 If lots of student interaction is your cup of tea, the dance-floor-style seating chart, shown in Figure 1, is for you. All the seats aim toward a central focus point — a large, open space in the middle of the room for activities, meetings, or instructional games. This arrangement also gives you a little elbowroom if you’re claustrophobic. Figure 1: The dance-floor seating chart in all its finery. Holding class discussions and debates in this type of arrangement is easy because students are able to hold eye contact with one another without constantly having to swing around in their seats. However, this seating chart requires a room with a lot of space in it. Though comfortable and welcoming, this arrangement isn’t the way to go with large classes. If you pace back and forth while speaking, consider using the runway-model seating chart, shown in Figure 2, which can put your pacing to good use and keep you from wandering aimlessly. 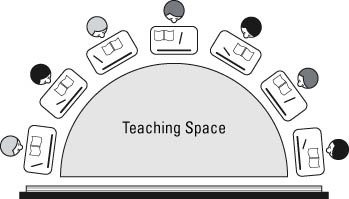 It narrows the space in which the teacher can easily maneuver, but it’s extremely effective in rooms that have blackboards on opposite ends of the room. You’ll find this arrangement more often than the dance-floor seating chart because it effectively fits more students into smaller spaces. This seating chart is the most practical (although not most ideal) way to arrange your chairs if class discussion is important to you, because students can always face at least half the class, and most can see the faces of about 75 percent of their classmates easily. Just remember, as you teach in the center aisle, you may have the unnerving feeling of being surrounded. Figure 2: The runway-model seating chart — effective but underrated. If you want to implement this style of seating, make sure that you limit the number of rows you use. Having three rows of five students is better than having five rows of three. To maximize class interaction, make the rows of students parallel to the center lane as long as possible. 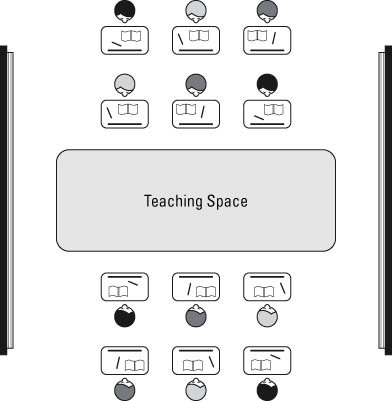 If you assign a lot of group work or split your class into teams for games or competitions, you might employ the seating chart shown in Figure 3. 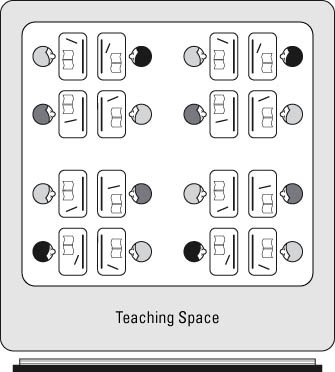 Through use of this seating arrangement, you’re telling students that you want them to operate independently of the rest of the class, forcibly separating them into small clusters, so that their desks are pushed together and individual teams are able to face one another easily. Keep in mind that students still need to be able to see the chalkboard just by turning their heads to the right or left. Figure 3: The independent-nation-state seating chart. The farther apart the clusters, the more independent the groups become. Don’t use this seating arrangement for the entire school year unless you’re willing to mix up the groups every now and then. Otherwise, students become overly familiar with one another and begin to form their own rules. Keeping students separated fosters enmity between groups and doesn’t promote the unity necessary to provide a welcoming classroom atmosphere. Offset the isolation this arrangement imposes with activities that involve the entire class. While this may not be a viable long-term seating chart, it illustrates an important point. If you leave your seats the same way day in and day out, you get into a rut. On the other hand, if students are used to the row-and-column traditional style, and all of a sudden they walk into your room arranged in a crazy design, their interest will be instantly sparked. A little change does everyone some good. Figure 4: The Battleship seating chart.